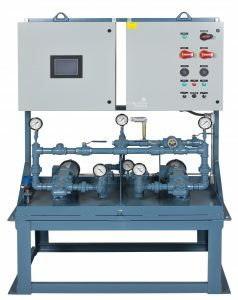 To complete the fuel oil installation a control system is used to make all the various pieces of equipment work together. Control systems can take the form of just simple motor starters with “Hand-Off-Auto” switches to complex systems making use of several control panels each with PLC’s and Touch Screen Operator Interfaces. 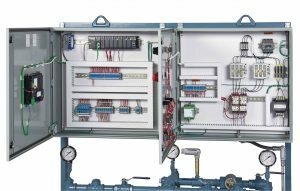 These control panels will communicate with each other making use of data links with the addition of some hardwired interlock signals. In some systems a “Master Panel” is employed to monitor the whole system and provide a point of contact to a Building Automation System (BAS). Control systems in the basic form come with either relay logic or PLC logic. For those applications where the control requirements are very simple a relay logic system is used. But the vast majority of the systems make use of a PLC which is pre-programmed at the factory. These PLC systems allow for great flexibility and expandability. They also allow for communication between this PLC and other devices. They provide LED indication of the status of inputs and outputs to make diagnosing of problems easier. With a computer and the necessary software it is easy to make changes to the program in the field. Control panels will include the necessary switches and lights to help the operator with control functions, but in many cases the operator interface to the system makes use of a color touch screen. This allows great flexibility and also provides the operator with additional information. For example a red light to indicate an alarm will not tell the operator when the alarm happened, but on the touch screen the alarms are time stamped so they know when they happened, what order they happened and what alarms have been acknowledged, have cleared, or are still active. These touch screens also provide the information in a graphical manner to aid the operators. Controls systems make use of communication of various types between control panels. These can take the form of dedicated contact closures or analog signals that are hard wired between panels to provide the utmost in reliability. For example, many of these are used as safety interlocks to keep from overfilling a tank. Other forms may be a data communication cable that use Internet type protocols (TCP-IP). When required to communicate to BAS there are several protocol standards which we can use to allow the BAS to monitor the fuel oil system. CFS Overview Brochure Provides a complete review of all the components that make up a system. Controls Brochure Provides an overview of control systems.